Now, dialysis patients will never have to do without their wonderful holiday on Crete. 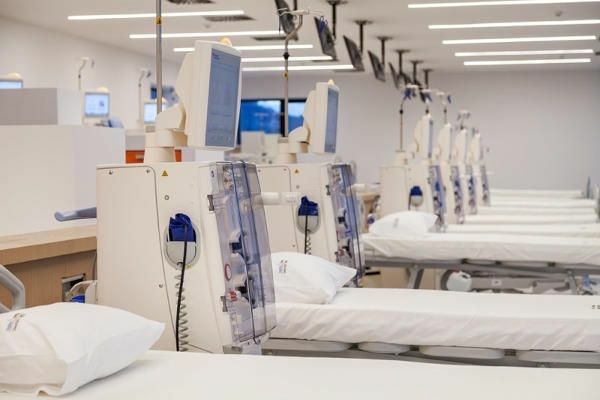 Guests at the Corissia Hotels who regularly need their dialysis on holiday are treated by highly qualified specialists in modern dialysis centres close by. The nearest centres with the latest generation of dialysis machines are located in the city of Chania, only about 35 km from Georgioupolis. We can arrange regular transport for our guests to their dialysis treatment at any time - simple and convenient. As part of your holiday planning we are happy to put you in contact with the dialysis centre, so that all the details can be clarified in advance. What is required before dialysis treatment on Crete? Haemodialysis (HD), Haemofiltration (HF) and Online Haemodiafiltration (HDF) - HighVolumeHDF are carried out daily by highly qualified dialysis staff with a specialist continually present. Multifunctional dialysis chairs and beds, personal TVs with satellite channels, wireless Internet and personal transport by mini bus or ambulance. For patients in possession of the European Health Insurance Card (EHIC), their statutory health insurance covers the cost of treatment.